Heating may not be at the forefront of your mind at this time of year, when often it is air conditioning that we are most grateful for! However, if you are in the process of planning some summer redecoration, how you choose to heat your home in winter, and what role the style of heating you have chosen plays in your interior design, is still incredibly important. After all, even during the periods when you don’t use your stove, fireplace or heaters, they can still be a dominant design feature in your rooms. Here, we look at some of the ways heating can become a key design element. For decades now, living room design has conventionally seen the television as the focal point of the room, with most seating furniture pointed towards it. However, as TVs become sleeker and less imposing, and some people are even doing away with having a TV set altogether in favor of watching things on tablets and computers, sometimes it is necessary to create a different visual focal point in a room. To this end, many designers are going back to pre-television times, when a fireplace would be the hub around which people would gather in a living room. Naturally, this kind of effect is easiest to create if you have a real open fire, but that isn’t actually essential. You can create the look of a beautiful fireplace complete with mantle and other eye catching elements using other kinds of heating, for instance wood burning stoves or pellet stoves. Where these stand out from the wall, they lend themselves well to being feature appliances, and you can find some gorgeous designs that can suit all kinds of property periods or design aesthetics. If you are considering buying a new stove and using it to create a great look in your home as well as for heat, there is a good round up of the top rated pellet stoves here. If you have a real, working fireplace, whether it runs on wood, coal, pellets or anything else, you can create some stylish looks using the accessories you need to run and maintain your fire as features. Consider elegant period looks with fireguards and brass pieces. You can find some great replica pieces or even look out for real antiques. For a charming, rustic look, you can use logs as part of your fireplace setting to create a practical and attractive feature. Whatever the look you are going for, accentuating your fire with pretty or robust looking pieces can allow you to really finish the look, while keeping the tools you need to look after a working fire close to hand. 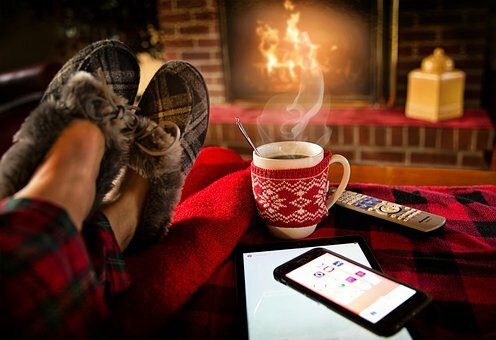 What if you love the idea of having a fireplace as an important feature in a room, but you have a different heating solution (such as underfloor heating) or can’t actually have a working fireplace in your property? Well, it is possible to get a similar look with a fake fireplace. You can create the look of a fireplace in all kinds of different ways, whether it is with an actual heat source like an electric fire designed to look like a real one, or without heat. You can create the look of an old, bricked over fireplace and simply have some attractive beams, tiles or other decorative features, or you can create a stunning fake fireplace yourself using fairy lights as features. This can be a great way to get the focal point effect of a fireplace without actually using it for your heating, and this can work really well in rooms with underfloor heating. Underfloor heating is excellent in terms of efficiency and heating effects, however it is, of course, completely invisible. While this may be preferable in some rooms because you can get a clean, minimalist look without any heaters or fireplaces on your walls, in living rooms in particular you may miss the cozy look of a fireplace. A fake fireplace or a fireplace-like design centerpiece can give you the best of both worlds. While you won’t, of course, need any fire accessories if you don’t have a real fire, you can still use them as ornamental pieces. A nice fireguard can even help you create the illusion of a fire where you don’t actually have one! If you have central heating, you probably won’t want to make a radiator a centerpiece in the same way as a fireplace. However, you can look for cool, stylish radiator designs that can make good features on your walls around your home. Radiators can come in all shapes and sizes these days, and so you can choose the look you want based on the period of your home and the interior design feel you are going for. Robust, chunky radiators in heavy iron can give a good vintage look, or you can get ultra-modern lightweight radiators in bright colors or textured designs to create accents on your walls. Radiators don’t have to blend in, and can be a great place to add a pop of color in a room. Remember that radiators can also be found in different shapes, so you can look for interesting designs like vertical radiators which can look fantastic when arranged with your furniture. Investing in a new central heating system shouldn’t just be about warming your home, but also about making it look even better, so don’t think of radiators as big, clunky, inconvenient things you have to work around, but style features in their own right! Whatever type of heating you think is best for your home or the room you are redecorating, you can make it look attractive and even make it one of the key points of interest in your interior design. Remember to consider factors like energy efficiency as well as look, however, when you are making decisions about heating. This entry was posted in Home and Living and tagged fireplace, heating.